Once upon a time, I kept another blog. I then tore it down, one of my many reinventions. Last week, I remembered an entry that took a forever to assemble; including contacting “The Paris Review” about copyright information, and getting the indentations and line spacing perfected. Love’s labors, now buried. “I’d really like to have those Georges Perec poems up and available on the web,” I thought. I searched my hard drive. The morning’s coincidences: I found that entry and those poems. My old blog, now protected and long giving no one access, including myself, finally gave itself over to my eyes. This after unsuccessful years of attempts. 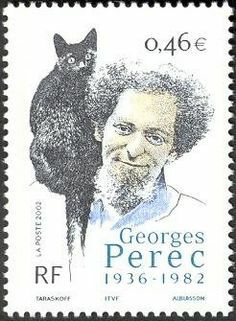 The day had no thought of Georges Perec. The locked blog opened by accident, as I hit the wrong link on old browser tab, an antiquated browser that I had switched to for only Goddess knows what reason this morning. I was in the door, having jumped through space and time into a long lost portal. And voilà! Georges et son chat, and the three poems. Here is that lost entry. My gift to the world today, giving Georges Perec back to it. 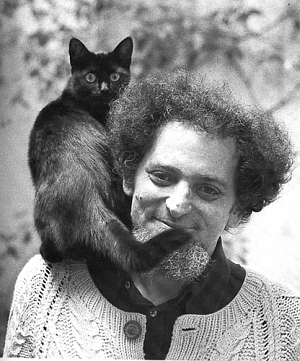 I’m returning to my blog with a very special entry, one I’ve had in mind for sometime: making available three poems by Georges Perec. I discovered these over two decades ago in a Winter 1989 issue of The Paris Review, and they’ve been venerated treasures since. Despite my efforts over several years, I was unable to find them in any published anthology, or find any publishing information on them. I contacted The Paris Review and inquired how I might go about getting permission to post them here. During my query, I was informed that The Paris Review did not own the rights to these poems. The estate of Georges Perec does. Who or what that is, I am not certain. I assume the estate will not sue me for copyright infringement: should the estate be offended, please accept my apologies in advance. Perec deserves more attention than he is given, and these songs, buried in a 1989 issue of The Paris Review, and available otherwise only to the handful of people who perchance purchase that back issue, need to be available to readers of this playful, imaginative wordsmith. Harry Mathews, who translated these three songs from the French, notes the following: These three “nuptial songs” date from 1980 and 1981; they first appeared as pamphlet 19 in this series published as La Bibliothèque oulipienne. I found it impossible to keep in translation the attractive procedure the author followed in writing them, limiting himself to the letters and the names of bride and groom. Where three quoted phrases appear in the second poem, I have substituted Wallace Stevens for Stéphen Mallarmé. — H.M. This evening, I’m listening to George Harrison, and memory’s landscapes compel a brief entry. I was about twelve. I may have been thirteen. I believe I was twelve. There was a song by Harrison that I’d come to know courtesy of an FM station that played adult rock. Not the top hits, but album classics and deeper cuts. “Don’t Let Me Wait To Long,” wooed me with its melody and lyrics. It wasn’t a popular song then. It’s since become known as one of George’s finer solo career moments. I called the radio station and asked about it. “Living In the Material World” was the album. The same album that “Give Me Love (Give Me Peace On Earth)” was on. I had to have that album. Had to have those songs. Wanted to hear more of this “Living In The Material World” stuff. Harrison’s mysticism and spiritual involvement with ISKCON (International Society For Krishna Consciousness) were by almost all accounts at their most intense during this album’s production. But the album wasn’t a big seller, the only cut garnering popularity was “Give Me Love,” which was released as a single, so there was limited post-issue album production. For an adolescent girl, living in the then small town of Folsom, getting my hands on this album entailed a spiritual pilgrimage. I journeyed to Tower Records in western Sacramento. There and back took a full day. My pilgrimage also involved saving my baby sitting money to pay for the album and transportation, dealing with multiple Regional Transit bus transfers to places I’d never been, and making the case to my mother why my life depended on this owning this album. Listening to Harrison this evening, as I think of that girl who listened to her heart, then took off by herself to possess the music that she wanted out of life, I feel many emotions, and see many soul level realities. Mildly impressed that girl was me, and shaking my head in disbelief that I’ve survived my headstrong abandon. That my mother allowed me this adventure speaks volumes: although she didn’t like the idea at all, west Sacramento was no place for me to be by myself, she decided trusting me with a journey she knew me capable of was better than trying to thwart my doggedness and having me sneak behind her back to get it. Some would think her careless; I believe she listened to something deeper. For my soul sees beyond the facts (“a twelve-year-old in west Sacramento by herself, a full day on Regional Transit, what kind of mother would allow that?”), and sees that pilgrimage to Tower Records as part of a deep unconscious hard wiring beyond volition, something I was meant to do. It wasn’t just the music, it was the spiritual longing I heard in Harrison’s lyrics, voice, and album title, something that resonated in me. My life journey — or soul purpose — was unfolding. That pilgrimage was one of many this life has given me, my evolution dictating a day trip from Folsom on a bus, so that my days and memory would hold Harrison’s music, his musically touching Divinity becoming one seed in my spiritual development. “Don’t Let Me Wait Too Long” ostensibly tells about waiting for one’s lover. But the song’s unmistakable subtext in the album’s spiritual context reveals that the awaited for lover brings the Divine Lover. Harrison’s expressed desires are otherworldly — or, as Krishna describes in the Bhagavad Gita, for the reality beyond illusion. In the days before another return of the sun to its placement when I entered this life (that is, my birthday), a single cord emerges in my life, and its variegated strands with their many hues and textures show me my soul’s constant and persistent evolution. Many of my so-called struggles have not been against me and the world, but about this emerging consciousness finding its way. I was learning to trust radical Love. That’s not an easy soul task. As my mortal fingers release their need for control, my spiritual hands gain strength. For I know with an unshakable depth that I’m a spiritual being having a human experience. Mortal existence falls to the side as the emptiness it is, a little more daily, and Reality opens before me in breathtaking beauty. Living in the material world becomes much easier with that perspective, but it’s taken many pilgrimages to get here from there.